Gen Xtinct: Hong Kong Phooey, number-one super guy! Who didn't love Hong Kong Phooey? 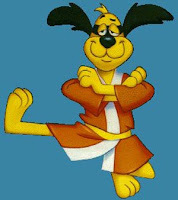 Martial-arts and Bruce Lee were taking off in the 1970s, so Hanna-Barbera came up with this doggy janitor extraordinaire. He worked at the police station and really wanted to solve crimes, but somehow always messed up. He found out about the crimes through helpful Rosemary, the police station phone operator (remember when there were telephone operators in almost every plot?). Scatman Crothers did his voice -- how cool is that? Yes, the revolution will be televised, and your childhood will be monetized.